Definition at line 33 of file CEvaluationNodeVector.h. Definition at line 39 of file CEvaluationNodeVector.h. Definition at line 30 of file CEvaluationNodeVector.cpp. Definition at line 35 of file CEvaluationNodeVector.cpp. 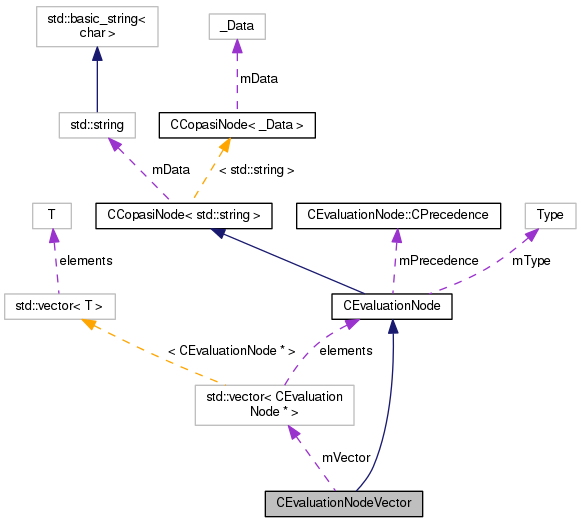 References fatalError, CEvaluationNode::mPrecedence, PRECEDENCE_FUNCTION, and VECTOR. Definition at line 53 of file CEvaluationNodeVector.cpp. Definition at line 58 of file CEvaluationNodeVector.cpp. Add a child to a node. If pAfter == this the child will be inserted at the fornt of the list of children. Definition at line 123 of file CEvaluationNodeVector.cpp. References CCopasiNode< _Data >::addChild(), and mVector. Definition at line 111 of file CEvaluationNodeVector.cpp. Definition at line 99 of file CEvaluationNodeVector.cpp. Definition at line 93 of file CEvaluationNodeVector.cpp. Definition at line 77 of file CEvaluationNodeVector.cpp. 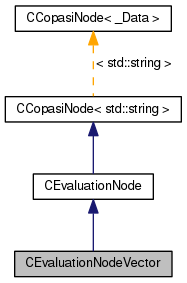 Definition at line 61 of file CEvaluationNodeVector.cpp. Definition at line 132 of file CEvaluationNodeVector.cpp. Definition at line 105 of file CEvaluationNodeVector.cpp. Definition at line 116 of file CEvaluationNodeVector.cpp. Definition at line 139 of file CEvaluationNodeVector.h. Referenced by addChild(), and getVector().